Thousands of Kenyans have attended the funeral of Wangari Maathai, Africa’s first female Nobel laureate. President Mwai Kibaki and Raila Odinga, the prime minister, were among the mourners at Uhuru Park’s Freedom Corner for Maathai’s state funeral on Saturday, eulogising the woman who earned herself the name ‘Tree Mother of Africa’ after the millions of trees planted across Kenya by her Green Belt Movement. Maathai succumbed to ovarian cancer late last month at the age of 71 (see WVoN story). “Besides being a woman of great courage and tenacity, the late professor Maathai demostrated, by example, the virtues of selfless service to the nation,” Kibaki said. Maathai briefly served as a junior environment minister in Kibaki’s government. During the funeral her three children and a granddaughter planted a tree at the park which she famously fought to save from plans by the regime of Daniel arap Moi, a former president, to construct a 60-storey building. 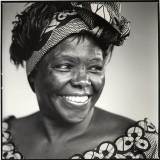 Maathai won a Nobel Peace Prize in 2004 for promoting conservation, women’s rights and transparent government. The environmental group Green Belt Movement, which Maathai founded, also campaigned on education, nutrition and other issues important to women.